Elipson Music Centre/Planet L review | What Hi-Fi? Design can often be divisive: one person’s eye-candy can be another’s eyesore. Bravo, then, to French firm Elipson for daring to be different with its new Music Centre, which shatters the monotonous 435mm-wide regimentation of most hi-fi design. The Music Centre’s 33cm diameter belies its jam-packed specification. Inside lurks a 24-bit/192kHz DAC, a slot-loading CD drive, a DAB+/FM tuner and enough inputs for most needs. You also get a Kleer-based USB wireless transmission dongle. It’s impressive stuff: the controls (touchpanel affairs with neat backlights) feel classy, and proper binding posts adorn the rear, alongside headphone outputs. It works very well too: even when driving our Monitor Audio Platinum-series speakers, the Elipson sounds impressively assured, its fast-sounding amplification and largely neutral balance making it an enjoyable listen with Dry The River’s exuberant New Ceremony. 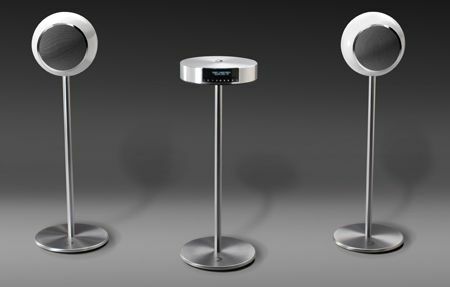 If the Music Centre’s distinctive, it’s nothing compared with the radical form of its partnering speakers, the Planet Ls. Beautifully finished, these spherical two-way speakers are supplied with a table-top ‘ring’ for installation (the floor stands shown here are £200 per pair). They’re unconventional to behold and equally distinctive to listen to, with a fine grasp of vocals, crisply defined imaging and a lucid, rhythmic presentation. Equally, though, they’re no rival for the drive or punch of the best conventional cones. Bass response is a little lacking too, although if you were sold on the speakers, you could always underpin them with an active subwoofer such as B&W’s PV1. The Music Centre is the stronger of the two components here, and would probably be better partnered with something more straight-laced, such as a pair of B&W 685s.